Wherefore, My beloved, as ye have always obeyed, not as in My presence only, but now much more in My abscence, work out your own salvation with fear and trembling. But I keep under my body, and bring it under subjection: lest that by any means, when I have preached to others, I myself should be a castaway. 24. For all flesh is as grass, and all glory of man as the flower of grass. The grass withereth, and the flower thereof falleth away: but the word of the Lord endureth forever. And this is the word which by the gospel is preached unto you. 8. For by grace are ye saved through faith, and that not of yourselves: it is the gift of God: not of works, lest any man should boast. Set your affection on things above, not on things of the earth. 2. And Pharoah was wroth against two of his officers, against the chief of the butlers, and against the chief of the bakers. 7. And he asked Pharoah’s officers that were with him in the ward of his lord’s house, saying, Wherefore look ye so sadly today? 11. And Pharaoh’s cup was in my hand: and I took the grapes, and pressed them into Pharoah’s cup, and I gave the cup into Pharoah’s hand. 13. Yet within three days shall Pharoah lift up thine head, and restore thee unto thy place: and thou shalt deliver Pharoah’s cup into his hand, after the former manner when thou wast his butler. 17. And in the uppermost basket there was of all manner of bakemeats for Pharoah; and the birds did eat them out of the basket upon my head. 19. Yet within three days shall Pharoah lift up thy head from off thee, and shall hang thee on a tree; and the birds shall eat thy flesh from off thee. 20. And it came to pass the third day, which was Pharoah’s birthday, that he made a feast unto all his servants: and he lifted up the head of the chief butler and of the chief baker among his servants. 1. And Joseph was brought down to Egypt; and Potiphar, an officer of Pharoah, captain of the guard, an Egyptian, bought him of the hands of the Ishmaelites, which had brought him down thither. 3. And the master saw that the Lord was with him, and that the Lord made all that he did to prosper in his hand. 4. And Joseph found grace in his sight, and he served him: and he made him overseer over his house, and all that he had put into his hand. 5. And it came to pass from the time that he made him overseer in his house, and over all that he had, that the Lord blessed the Egyptian’s house for Joseph’s sake; and the blessing of the Lord was upon all that he had in the house, and in the field. 6. And he left all that he had in Joseph’s hand; and he knew not ought he had, save the bread which he did eat. 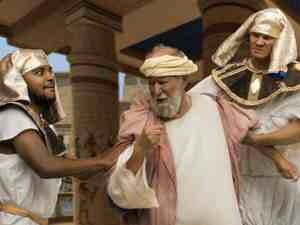 And Joseph was a goodly person, and well favoured. 7. And it came to pass after these things, that his master’s wife cast her eyes upon Joseph; and she said, Lie with me. 8. But he refused, and said unto his master’s wife, Behold, my master wotteth not what is with me in the house, and he hath committed all that he hath to my hand. 13. That she called unto the men of the house, and spake unto them, saying, See, he hath brought in an Hebrew unto us to mock us; he came in unto me to lie with me, and I cried with a loud voice. 14. And it came to pass, when he heard that I lifted up my voice and cried, that he left his garment with me, and fled, and got him out. 15. And she laid up his garment by her, until his lord came home. 16. And she spake unto him according to these words, saying, The Hebrew servant, which thou hast brought unto us, came in unto me to mock me. 17. And it came to pass, as I lifted up my voice and cried, that he left his garment with me, and fled. 18. And it came to pass, when his master heard the words of his wife, which she spake unto him, saying, After this manner did thy servant to me; that his wrath was kindled. 19. And Joseph’s master took him, and put him into prison, a place where the kings prisoners were bound: and he was there in the person. 20. But the Lord was with Joseph, and shewed him mercy, and gave him favour in the sight of the keeper of the prison. 21. And the keeper of the prison committed to Joseph’s hand all the prisoners that were in the prison; and whatsoever they did there, he was the doer of it. 22. The keeper of the prison looked not to any thing that was under his hand; because the Lord was with him, and that which he did, the Lord made it to prosper. 1. And it came to pass at that time, that Judah went down from his brethren, and turned into a certain Adullamite, who’s name was Hirah. 5. And she yet again conceived, and bare a son; and she called his name Shelah; and he was at Chezib, when she bare him. 7. And Er, Judah’s firstborn, was wicked in the sight of the Lord; and the Lord slew him. 8. And Judah said unto Onan, Go in unto thy brother’s wife, and marry her, and raise up seed to thy brother. 9. And Onan knew that the seed should not be his; and it came to pass, when he went in unto his brother’s wife, that he spilled it on the ground, lest that he should give seed to his thy brother. 10. And the thing that which he did displeased the Lord: wherefore he slew him also. 11. Then said Judah to Tamar his daughter in law, Remain a widow at thy father’s house, till Shelah my son be grown: for he said, Lest peradventure he die also, as his brethren did. And Tamar went and dwelt in her father’s house. 12. And in process of time the daughter of Shuah Judah’s wife died; and Judah was comforted, and went up unto his sheepshearers to Timnath, he and his friend Hirah the Adullamite. 14. And she put her widow’s garments off from her, and covered her with a vail, and wrapped herself, and sat in an open place, which is by the way to Timnath; for she saw that Shelah was grown, and she was not given unto him to wife. 17. And he said, I will send thee a kid from the flock. And she said, Wilt thou give me a pledge till thou send it? 18. And he said, What pledge shall I give thee? And she said, Thy signet, and thy bracelets, and thy staff that is in thine hand. And he gave it to her, and came in unto her, and she conceived by him. 19. And she arose, and went away, and laid by her vail from her, and put on the garments from her widowhood. 20. And Judah sent the kid by the hand of his friend the Adullamite, to receive his pledge from the woman’s hand: but he found her not. 21. Then he asked the men of that place, saying, Where is the harlot, that was openly by the way side? And they said, that there was no harlot in this place. 24. And it came to pass about three months after, that it was told Judah, saying, Tamar, thy daughter in law hath played the harlot; and also, behold, she is with child by whoredom. And Judah said, bring her forth, and let her be burnt. 26. And Judah acknowledged them, and said, She hath been more righteous than I; because that I gave her not to Selah my son. And he knew her again no more. 19. For though I be free from all men, yet have I made myself servant unto all, that I might gain all the more. 20. And unto the Jews I became as a Jew, that I might gain the Jews; to them that are under the law, as under the law, that I might gain them that are under the law. 21. To them that are without law, as without law, (being not without law to God, but under the law to Christ,) that I might gain them that are without law. 22. To the weak became I as weak, that I might gain the weak: I am made all things to all men, that I might by all means save some. 23. And this I do for the gospel’s sake, that I might be partaker thereof with You. 23. And in that day ye shall ask Me nothing. Verily, verily, I say unto you, Whatsoever ye shall ask the Father in My name, He will give it to you. 24. Hitherto, have ye asked nothing in my name: ask, and ye shall receive, that your joy may be full.